Villa Sunset ... on the peninsula Port Charlotte on the Gulf of Mexico, to feel good and relax far from the white sand beaches of the Gulf of Mexico, central to all the attractions of Florida. The "Villa Sunset" is equipped so that you spend an unforgettable vacation and can relax optimally. Our air conditioning provides you a pleasant stay even with such hot temperatures! Internet connection is available. The kitchen is modern and fully equipped with dishwasher, fridge / freezer with ice crusher, microwave, toaster, coffee maker, etc. For cozy poolside BBQ, our electric grill. To avoid having to take your entire wardrobe, we have our house equipped with washer, dryer, ironing board and iron. In every bathroom there is a hair dryer; Towels and beach towels are also part of our equipment. Our TV set allows you to receive all local stations. Our 4 bicycles are of course free of charge. This also our little guests feel at home, we have our house equipped with the following accessories: Cot bedding highchair. Away from the hustle and bustle of the Gulf Cove residential area, on the Port Charlotte peninsula on the Gulf of Mexico, yet centrally located to Englewood Beaches (10 minutes), Venice, Boca Grande (30 minutes) and Port Charlotte (10 min.). Final cleaning: once per object costs in the amount of 135 EUR (obligatory). Clean, simple, open layout. The pool area was nice with a dining area and good afternoon sun. 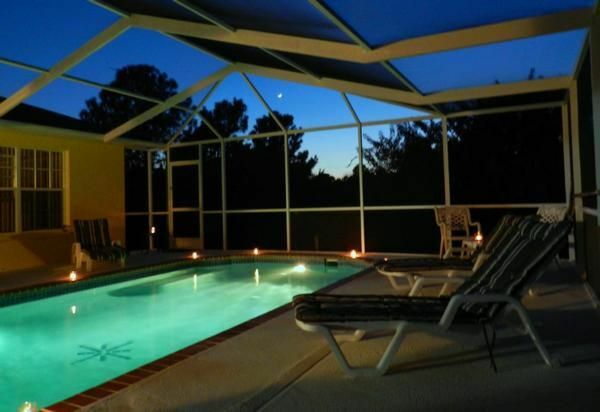 Quiet neighborhood close enough to both shopping of port Charlotte and the beach at Englewood. Needs an actual BBQ.. I want to punch george foreman after my week there. Decent Value for the price. although the place was very clean upon arrival, there were a couple of dead cockroaches (palmetto bugs) on the floor.We continued to see small bugs in the house and eventually bought some insect spray and sprayed ourselves. The pool was very nice and the caretaker was more than helpful. The television programming is somewhat limited but there is plenty of golf in the area, which is our main reason for coming to Florida. just needs to be exterminated a little more often.